There were four slots available for RA delegates and here are the results. 323 people voted from 15 sites. If Alyson or Julie win state seats, Aja Cook and Pat Parker will move up to fill their local positions. The results from the state election will be revealed later this month. Thanks for all your help with the NEA-RA elections! Special thanks to Bob Blaine for all his work on this. We will have the results to share soon. Sylvia and I met with the district yesterday regarding POL usage. We will have more to share on the POL issue at the next Rep Council meeting as we gather information and explore options. A letter from the district is supposed to sent next week to explain specifics about the numbers on the form, explain that your signature is only verifying the leave usage (not the calculations at the top), and to name a contact person to whom members should address their questions? HR sent an email to secretarial staff and principals to remind them that members should not be asked the specific reasons for absences, only the leave description (PL, POL, etc) when making corrections to their form. However, if the administrator thinks the leave is inappropriate or not consistent with the contract, then the administrator can enter into a clarifying conversation with the employee. In this case, we strongly encourage members to request VTA representation at the meeting where this is to be discussed. In order to receive Bereavement leave, the employee will be required to tell their administrator who passed and how far away the service is. I spoke to Dr. Niederkorn regarding the Board Policy on fees and charges. Information about this is supposed to be disseminated to staff by the principals. Any questions should be directed to principals. I will send an email to members as a heads upon this. I am also sending an email to members about the upcoming election for VTA officers and directors and State Council Representative. Nominations for these positions will be made at the April 9th Rep Council meeting which will be at Chevy’s at 3:30. __Encourage anyone interested in running for a position to get their nomination in. __Share member benefits information from the presentation. Direct folks to the CTA website to learn more. __Let your staff know we will have an update on health care at the next meeting. Also, please reiterate that members can pull spouses and children off their plans at any time, and we encourage families to shop around for plans that may be less expensive or better options for them. __Encourage staff to attend the School Board mixer which will be held at Chevy’s on April 9th at 5:15 right after the Rep Council meeting. __And, as always, remind your staff to go to the www.vacateachers.org website for the latest news, documents, and other important information. Elementary – PI issues at Fairmont and Padan. Junior High – off campus during prep issue at Vaca Pena. 1) – Approvals of the minutes – the minutes were approved. 2) – Approval of the agenda – the agenda was approved. Special CTA presentation on member benefits from Henry Ahn – for more information, go to http://www.cta.org/Member-Services/Member-Benefits.aspx or http://www.vacateachers.org/member-services/ and be sure to talk to your site rep.
Elections’ plan/schedule – Bob Blaine will collet ballots on Thursday the 14th at 11 am to collect ballots for the NEA-RA state and local delegates. Please keep the member lists Moira mailed earlier available for subsequent officer/state council elections in April. Plan for officer elections – Moira will advertise for VTA officer candidates between now and April 9th. Nominations for the officers will be taken at the April 9th rep council meeting. After April 9th, we’ll have a week to do the election. We will also hold an election for Jerry Eaton’s state council seat during this election cycle. Health care update – tabled until the April 9th rep council meeting. No RIF notifications for the 13-14 school year – was announced at the last school board meeting. A press release will be distributed via our social media and to the local paper. There may be a displaced teacher pool, but there will be no layoffs for certificated personnel. School board elections – have gone to an even year cycle as of the last school board meeting. School board members who were up for election this year will have their terms extended by one year to accommodate the change. Leave information – the process behind this was reviewed and members are advised to ask questions/give feedback about this process to the VUSD HR department. For more information on the various kinds of leave, please go to – http://www.vacateachers.org/vta-documents/3-most-common-types-of-leave/ This report finished with some questions about bereavement leave procedures and contractual issues associated with various kinds of leave. Motion – begin discussion with VUSD regarding leave procedures and leave contract language interpretation – seconded and approved. Early college – an MOU was signed to formalize this process. There will be two coordinator positions advertised for this program and students will be drawn from both junior high schools. Elementary prep/new report card MOU – will be drafted and potential changes were reviewed and discussed. Members are urged to give input through the 2nd Trimester Report Card Survey. Illegal Student Fees – policies coming out of the board meeting were reviewed and discussed. Some questions for Moira to take to the superintendent were recorded and she will report back at the next rep council meeting. VUSD Retirement Gala table – the Action team will investigate the cost of VTA purchasing a table for the Gala and /or the purchase of individual tickets for VTA leadership to attend and speak at the function. VTA t-shirts – rep council members are urged to help themselves to the VTA shirt stock before Brenda Hensley’s mom makes them into quilts, which will be raffled off to fund the VTA scholarship fund. Next rep council meeting – on April 9th will be at Chevys and the school board mixer will follow. 5) – Treasurer’s report – Brenda will prepare an updated budget report and proposed 13-14 VTA budget for the next rep council meeting. Chamber mixers – the next chamber mixer will be held on April 4th. T-shirts, stickers and the banner will be used to advertise VTA. Vacateachers.org updates – the pdf compatibility issues seem to have been resolved and the mobile site is up and running. E-board members should also watch their email inboxes for some documents to review prior to the meeting on March 26th. Region one organizing academy – is scheduled April 19th and going until the 21st. The focus will probably be on internal organizing and external organizing. School board candidates – has been postponed, but we’re still looking at some great candidates for 2014. Bargaining – will sunshine the contract articles we’re going to open for the 12-13 session at the next school board meeting. Teacher safety – the process for developing procedures for “red flagging” relevant students was discussed. Personnel issues – are ongoing as the year continues. Administrative regulation regarding classroom assignments – if your principal is not following board procedures regarding classroom assignments please let Sylvia know. Human Rights – Alyson reported that the bullying class went well and some of the statistics and themes which came out of the class were reviewed and discussed. Special Ed – Padan unit members will be starting a program for their ED students. 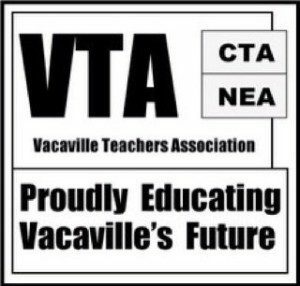 Vacaville – In another sign that California is finally starting to recover from the great recession, after 5 consecutive years, Vacaville’s public school teachers will not receive layoff notices this year. In what has become an annual rite of passage for some teachers: the announcement of potential layoffs on March 15th, the final notification of layoffs on May 15th, and the hope for a rescission over the summer will not happen this year. Vacaville Unified School District John Niederkorn, when announcing this good news during the March 7th school board meeting, cited the passing of Prop 30, increased student enrollment, and past concessions from employee groups as reasons for VUSD being able to avoid issuing layoff notices for the 13-14 school year. The registration deadline for the Redwood Educators Conference has been extended to Friday, April 5th! Attached is the revised flyer for distribution to your members.